The Permanent Exhibition Room is on the 2nd floor. It is a continuous and large exhibition room that covers 2,121m². In all, it is divided into 11 sections. The first section exhibits the national treasure our museum is known for. The last section introduces the festival representing this city. What we can call the very first state in the Japanese archipelago came into being here in this region. It is written in a Chinese chronicle, History of the Late Han Dynasty, that in the year 57 A.D., a seal together with a decorative ribbon was given by Emperor Guangwu of the late Han Dynasty to envoys of a king who came to ask the emperor to support their kingdom. This seal is none other than the Gold Seal. For some reason, this seal was buried in Shikanoshima Island in Fukuoka and discovered in 1784. It was immediately presented to the feudal lord of the time and certified by clan scholars such as Kamei Nanmei to be the seal referred to in Chinese historical records. In 1931, the Gold Seal was designated as a National Treasure of Japan. The seal is a well-known item from the fact that even Japanese textbooks refer to it as a cultural asset to ascertain how the Japanese nation came into being. However, its glitter and size very often bring a sense of new astonishment to many people. During the ice age, the greater part of the Genkai-nada Sea as we know it today was land. Approximately 26,000 years ago, people came from the Asian continent and settled here. Around 15,000 years ago, a sea came to separate the region from the continent. The people lived by cooking food the sea and forests provided and by using arrows to hunt. No one knows when, but rice farming was introduced from the Asian continent. Setting a rich rice harvest as the foundation of their society, the people of the region started to run agricultural communities. This grew to the existence of a national state. In order to strengthen the country, the King sent envoys to the Emperor on the Asian continent and worked hard at introducing highly advanced culture. The center of the nation moved east. This region played an important role as a gateway to diplomacy and commerce and as the front line of defense for the nation. The government of the time established a diplomatic facility called the Korokan in this region. The ruins of the Korokan were discovered in Fukuoka City in 1987. From the Korokan, we can learn about international exchange in ancient times. Commerce carried out at the Korokan fell into disuse by the middle of the 11th Century. Taking its place was Hakata, which saw an expansion in the scale of its trading activity carried out by Chinese traders living in Hakata referred to as Hakata Koushu. They formed a China town called Toubo and their activities led to glittering ceramics and new ideas including Zen being introduced into Japan. After Mongolia’s attempts at invading Japan, trade fell into the hands of the Japanese. They managed Japan-Ming trading ships and travel to the Ryukyu Islands and the Korean Peninsula. Hakata flourished greatly as a result of the wealth of these traders who become wealthy merchants through their East Asian commerce. However, this had the effect of turning the region into an intense battleground of conflict amongst samurai warriors. Once into the Edo Period, the House of Kuroda became the new feudal ruler of the region. Its first feudal lord, Nagamasa, established a new castle and castle town and named the area Fukuoka. Influenced by each other, Fukuoka grew as a castle town and Hakata as a town of commerce. The long period of peace in society gave rise to the creation of new forms of study and thought. The rushing tides of modernization could be felt even in this region at the end of the 19th Century. Bringing together Fukuoka and Hakata, Fukuoka City was created in 1889. Taking the momentum from its Exposition, Fukuoka City equipped itself with an urban area and a transportation network, and became Kyushu’s number one city. Although it was reduced to ashes in the Great Air Raid at the end of the Pacific War, its people were spiritually uplifted by festivals and sports and began taking steps towards their recovery. After Japan’s period of rapid economic growth, Fukuoka, as an urban city, increasingly grew. Thinking its proximity to other Asian cities would create regional vitality, Fukuoka City held the Asian-Pacific Expo in 1989. The Seaside Momochi district, where the Fukuoka City Museum is located, is a relatively new area created at about this time. Perhaps we can see the shape of Fukuoka’s future from this area. A locality has its way of life. What does it mean to live in this region? Taking a clue from several events, which happen to a fictitious 4-generation family, we will take a look at how the people of Fukuoka and Hakata thought and conducted themselves and conveyed their story within their social environment. The Hakata Gion Yamakasa is a festival representing this region. It has greatly impacted regional society and culture. The Japanese, fearing epidemics from ancient times, have put on many festivals at the beginning of summer, a steaming hot season in Japan, to pray against such diseases. 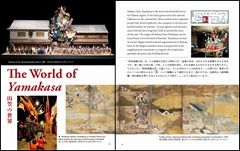 The origin of the Hakata Gion Yamakasa can be traced to be this kind of festival. Illustrating the acts of historical and literary heroes through dolls and various decorations, the Yamakasa used to be a festival, which at first quietly paraded through its districts. However before anyone noticed, it became a festival that makes its rounds with a dynamic dash. Various district-based organizations called Nagare located within Hakata area administer the festival. Within these organizations, tight human bonds of friendship are in place to support this traditional yet absolutely gorgeous, dynamic and heroic festival.